At Bedré Fine Chocolate, we have a passion for making gourmet chocolate. Visit our state-of-the-art, 34,600 square-foot manufacturing facility to see us in action creating our entire lineup of sweet sensations. Take a peek through our floor-to-ceiling windows to get an up-close look at our process of turning a sweet idea into delicious treats. While we don’t offer guided tours, our manufacturing floor is visible for everyone to see. 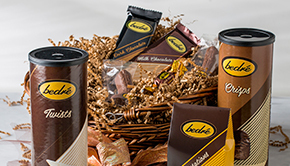 Bedré Fine Chocolate is located at Exit 55 on I-35, and is open Monday through Sunday, 9:00 a.m. to 6:00 p.m. Please note: Manufacturing may or may not be in operation during these hours.